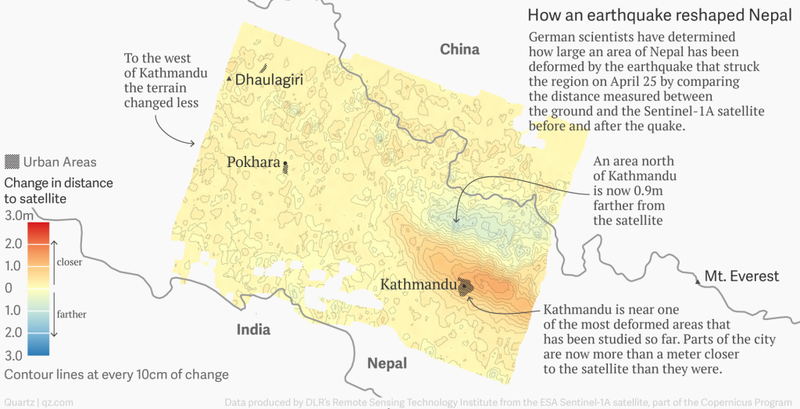 The ground has shifted beneath Nepal’s feet, and space agencies around the globe are rushing to measure it…Using satellites that bounce radar waves off the earth and listen to the echo, scientists are able to calculate the distance between those satellites and the earth. Comparing the measured distances before and after the earthquake shows how much the earth has changed shape. 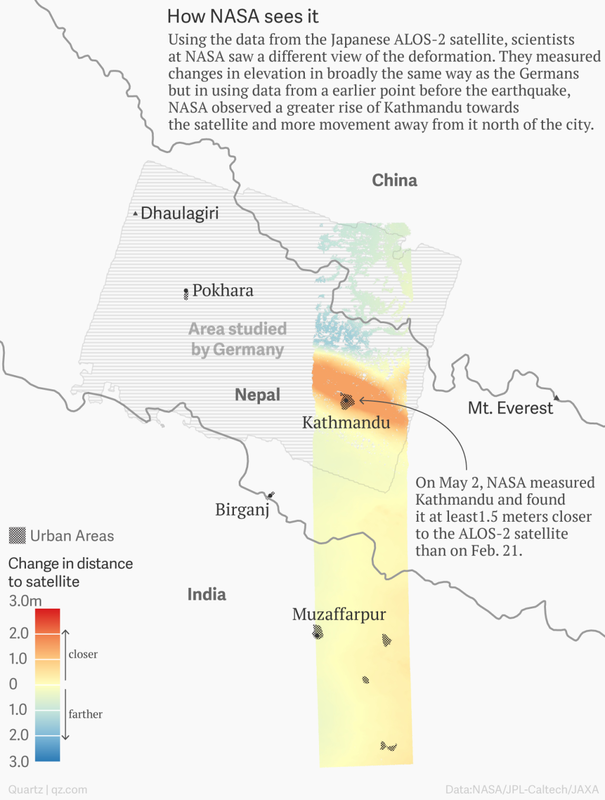 Data collected by the European Space Agency’s Sentinel-1A satellite and analyzed by Deutsches Zentrum für Luft-und Raumfahrt, a research center of the German government, show that areas near Kathmandu were a meter closer to the satellite on April 29 than on April 17. Areas north of the city were found to be nearly a meter farther away. This type of measurement isn’t perfect. 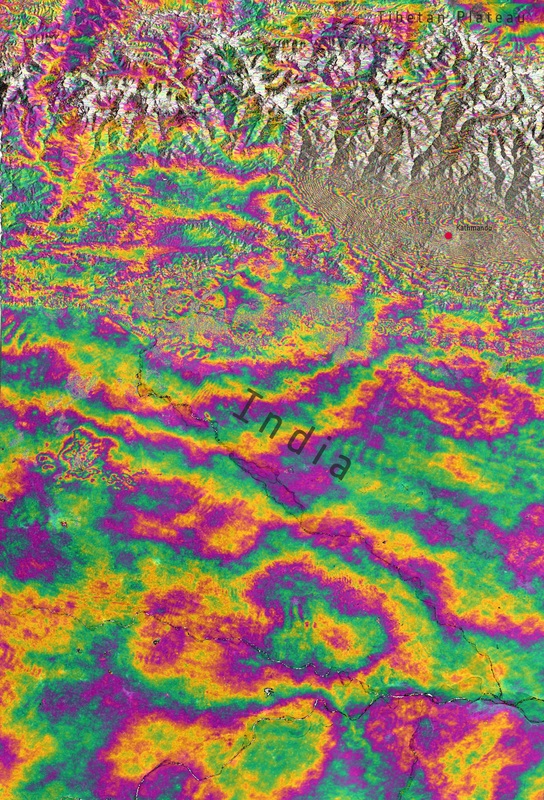 Radar can be scattered by snow and heavy vegetation, according to NASA, making areas covered with those features hard to compare. Satellites also don’t look straight down on all areas of the earth, but at an angle while they orbit from pole to pole. This website of UN OCHA is a good portal for ongoing status updates, assessments and other tech info about the situation in affected areas. Another very useful resource for those in the field is HDX, a collaboration between UN OCHA and a design firm to create a user friendly data sharing platform, described in this article on Fastcompany. 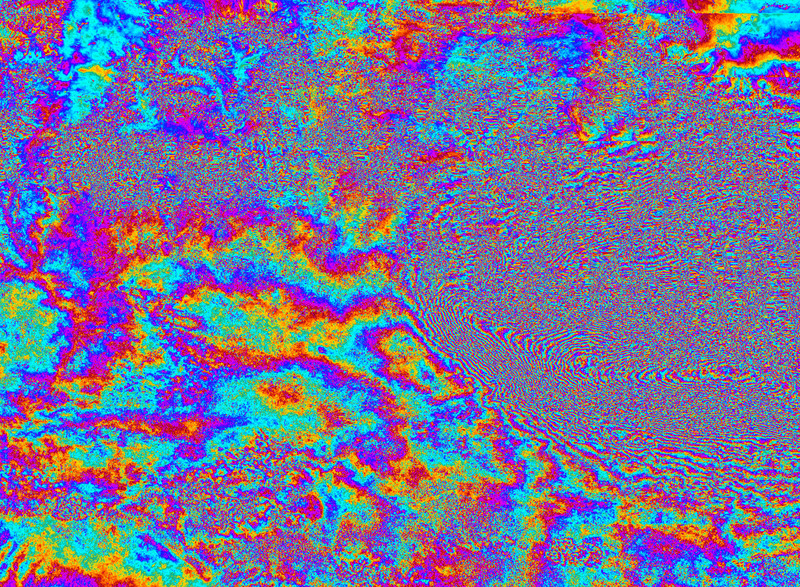 This entry was posted in natural sciences and tagged data visualization, earthquake, HDX, Nepal, UN OCHA, WFP. Bookmark the permalink. Quite extraordinary the power, majesty and beauty of earth….and humans are so inconsequential. I wonder how rainfall run off and river flow has been affected.